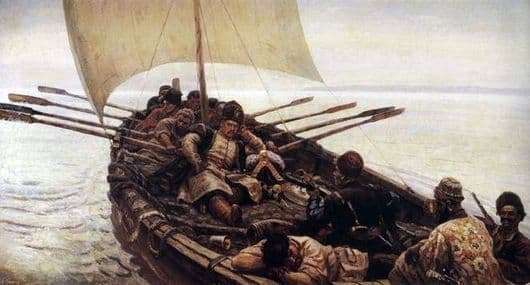 The original plan of the picture “Stepan Razin” was a legendary romantic story about that episode from the life of the rebellious ataman, when he throws his beloved Persian princess overboard into the running wave. The demonstration of the moral victory of the leader and the preference of the interests of the troops led over personal interests fascinated many great artists and poets. But Surikov refused to implement this traditional idea, focusing on the inner world of a person whose thoughts embrace problems of a wider scale, incompatible with the personal tragedies of individual people. V. Surikov’s painting “Stepan Razin” is filled to the brim with spaciousness, air and light. Above the horizon dawns, painting in a soft purple light the entire boundless space of the picture. A large boat sailing under sail and with four pairs of oars rapidly moves along the wide Volga-mother river. Rowers in tense postures, with concentrated faces, are fully immersed in the action, which gives acceleration to the ship. The captured moment of raised up oars and strained sail makes the boat outwardly similar to a huge bird in flight. In the center of the picture, against the background of the rowers and the sails sits, immersed in his thoughts, the main character – Stepan Razin. A successful trip to the Caspian environs brought great booty, which the Cossacks sitting in the foreground rejoice. One of them wearily bowed his head to the side of the boat, in the hands of the other – a cup of wine. Two more, without letting go of their weapons, celebrate their victory. And only the chieftain, leaning on an expensive saddle, reclining, props up his head with his hand, and on his face there is an expression of serious reflection. The artist wrote etudes to the picture on the Don and in Siberia. The appearance of Krasnoyarsk scientist Ivan Timofeevich Savenkov and his son Timofey was taken as a prototype for writing a portrait of Stepan Razin. Although contemporaries, who knew Surikov well, found a noticeable similarity in the features of the hero with the appearance of the author himself. At least, those reflections that did not give rest to the artist, he found consonant with the thoughts that came to his hero’s forehead.